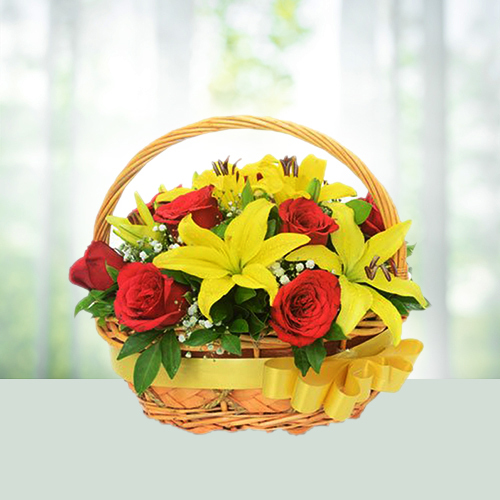 Offer the special people in your life this Seasonal 10 Red Roses N 6 Yellow Lilies Basket and make their hearts leap in joy. Note: As per the availability design of Basket may change. Flowers Delivery Bhagalpur, Send sweets Karur, Wedding Cake Dharward, Diwali Mithai Khanna, Send Flowers and Gifts to Gajraula, Online Shop New Bombay, Flower to Ongole, New Year Flowers Mirzapur , Fresh Fruits Valsad, Send Gift Ichalkaranji, Dry Fruits to Sri Ganganagar, Birthday Delivery Jamshedpur, Sending to Jamshedpur, Flower shop Kochi, Karaikal Online Cake Delivery.